Our Sneaker Artist Contest was a blast and we’re excited to announce our winner! Some incredible artists braved the cold and snow to show up and MWS was teaming with talent and passion. As contestants began to file in we became aware immediately that this was going to be a TOUGH choice. This is another robust and enthusiastic community of artists, and seeing the dedication was absolutely inspiring. MWS provided each contestant with a three-foot section to display their work and five minutes to present what they had done. The work was impressive, so much so that customers who had come in for unrelated shopping were drawn in and intrigued enough to participate in the voting. In addition to the online votes, we tallied the votes in the store and a winner emerged. 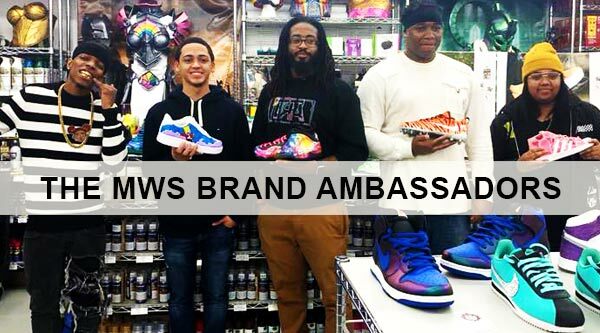 The Repair Artist came out on top after a very close race, to become our first ever MWS Sneaker Ambassador and take home a prize of over $600 worth of sneaker supplies. Armone Tyson, aka The Repair Artist, had driven all the way from Michigan! As you can imagine, anyone with that degree of determination really brings an A game. We were impressed not only with the quality of his work, but also with his composure and maturity. He brought a wide range of work with him and truly went the distance in every way! His style is composed of hand painting, water graphics, and airbrushing designs, most of which are heavily inspired from real life events and/or things that touch him personally. For example, his brother has sickle cell anemia, so one of his pair of sneakers were painted with healthy and sickle cell blood cells to raise awareness for the disease, with all of the proceeds from a GoFundMe he created being donated. We love this very personal form of expression and way of connecting with the world. We were blown away by the camaraderie in this community. There was a healthy and encouraging sense of competition, but also lots of curiosity, warmth and encouragement. These are some friendly folks who like sharing their knowledge, passion and artistry. Please help us welcome these dedicated artists to our team by following them on social media. We’re excited to see more of their work, as well as having more workshops and events involving this community! Tagged artistry, contest, creativity, Jason Markk, sneaker artist, sneaker painting, sneakers, wardrobe, winner. Bookmark the permalink.